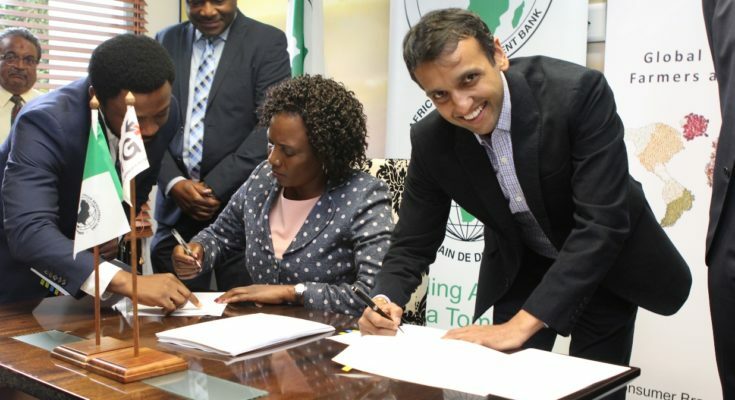 African Development Bank’s Trade Finance Operation has signed a loan agreement for a soft commodity finance facility (SCFF) with the Export Trading Group (ETC) in an effort towards promoting food productivity in the region. According to a statement sent to Business a.m. on Thursday, the facility is innovatively structured as two successive loans of US $100 million, each with a tenor of up to 2 years, thus signifying the African Development Bank’s strong commitment to the promotion of agriculture in Africa. This SCFF is one of the core trade finance instruments in the Bank that will provide pre- and post-shipment finance along various stages of ETC’s commodity value chain operations in the 17 countries expected to benefit from the initiative. The intervention will help local farmers and soft commodity suppliers grow their revenues and produce quality crops for export. The facility, specifically, will be used to finance the procurement of identified agricultural commodities from over 600,000 farmers. Upon purchase of the soft commodities, the SCFF will provide working capital to ETC thus enabling the company engage in value addition/processing of the soft commodities such as cashew nuts prior to export, and provide funding to procure farm inputs (mainly fertilizer components for blending) to be supplied to farmers so as to ensure consistency and quality of the commodities being supplied to ETC. According to the statement, the trade finance intervention along the agricultural value chain will enable the Bank to reach many small-scale farmers indirectly through ETC, a pan African aggregator that has deep knowledge of the market in which it has accumulated a 50-year track record; understands the agricultural sector operational risks and is able to mitigate and manage them. Josephine Ngure, African Development Bank Director General for the Southern Africa Region, while speaking at the signing ceremony, said, “This facility will significantly contribute not only in improving food productivity in Africa but most importantly in value addition and the wide distribution of food across the continent using ETC’s broad distribution networks. Originally established in Kenya in 1967, ETC’s operations connect commodities sourced at the farm gate to local economies, from the local economies to the broader marketplace and emerging markets to each other and the world. ETC’s principal activities include farm inputs and farm implements, processing of agricultural commodities and distribution. The Group employs more than 6, 000 people and has investments in bioenergy, farming, forestry and logistics and its operations are present in 26 African countries. As one of the largest commodity aggregators on the continent, ETG plays a significant role in the promotion of agribusiness in countries where agriculture is on average the biggest employer, providing in excess of 70 percent of total employment and 77 percent of all women’s jobs. Through the implementation of innovative programmes such as this SCFF, the African Development Bank seeks to promote private-sector development in line with its Ten Year Strategy (2013-2022) and the Trade Finance Program, which aim to promote exports through support to agriculture and SMEs. The initiative is also perfectly aligned with the Bank’s Financial Sector Development Policy and Strategy (2014-2019), whose main priorities are to broaden and deepen Africa’s financial systems by putting finance at the centre of Africa’s productive capacity. Lastly, by channeling financial resources into agricultural value chains, the Bank is scaling up its interventions aimed at making Africa a net food exporter, self-sufficient in key commodities and operate commercially viable agribusinesses, which is a core feature of the Feed Africa Strategy for Agricultural Transformation in Africa 2016-2025.